Mr T. C. Hudson was a prolific poet, playwright and freelance writer, born in Bellevue Road, Cowes (at that time within the Parish of Northwood) and a long-time resident of Northwood. He has contributed many articles and poems to this website which can be viewed within this section. Mr Hudson passed away on Friday 13th July 2007. I have now been given most of Mr Hudson’s written work and have donated many of his Plays to the Apollo Theatre in Newport, Isle of Wight. I shall continue to transcribe articles and poems to this website as time allows. Mr Hudson was also the author of, amongst other works, the children’s book ‘ADRIAN’S GHOST’. PLEASE OBSERVE AND RESPECT THE COPYRIGHT STATEMENT ON EACH ITEM AND IF AN ITEM IS REPRODUCED PLEASE ACKNOWLEDGE THE AUTHOR. For more information on Mr Hudson please read his Autobiographical Notes in the Articles section. We were all very sad to learn of the passing of one of Northwood’s literary figures, and I do consider that we will be all the poorer for his passing. For many years T. C. Hudson has contributed poems to Northwood News, some having been written at a moment’s notice directly in response to my requests, and in all Cyril demonstrated his superb command and knowledge of the English language. Many are the times that I have been prompted to check on a particularly obscure word, only to find that it has been spelt not only absolutely correctly but contextually appropriate. Cyril had a basic education until he took it upon himself to improve his knowledge by profound reading and correspondence courses. During the war he was tutored in Greek, French and Logic by The Reverend Constantine Sinclair, the Rector of Chale. Cyril worked at J. S. White & Co., firstly in the machine shop in Cowes, later as a draughtsman in the Drawing and Planning Department at the Somerton Works and finally Head of that department and deputising for the Works Manager. He was transferred to Head Office when the Somerton Works closed in 1966 and retired in 1975, thereafter devoting his time to the main loves of his life, water colour painting and literature. His literary output has been profuse, with over 500 poems, 100 articles and short stories, and 30 plays amongst his achievements. He has won over 70 cups and shields at various festivals and had several books published. Oh, and one radio play broadcast on Radio 2 in 1970. I have only been able to transcribe a selection of his works, which are displayed on this village website, but I do hope that they will remain of interest to Island residents as many of them reflect life on the Island and in Northwood from a bygone age. I am continuously adding to my selection of poems and articles, as time allows me to transcribe them from the fading originals. Please do have a look at the selection of Cyril’s works on this website. They contain some fascinating tales about many local characters and provide some historical background to Northwood’s past. Have a look also at his Autobiographical Notes, which give more details of his life. I most certainly consider it a privilege to have known TCH on a personal basis. Former Editor, Northwood News Parish Magazine. With the cessation of brick-making some years ago, there came to an end the Isle of Wight’s connection with one of its most lucrative products – a connection that six generations of the Pritchett family had done much to maintain. Mr T.C. Hudson’s personal history of his early life in Northwood 1933 to 1945. A novel containing Isle of Wight dialect. An appreciation of Steephill Castle. James Macartney, M.D. – Part 1. James Macartney, M.D. – Part 2. George Eliot (Mary Anne Evans) – Part 1. George Eliot (Mary Anne Evans) – Part 2. Admiral Lord Jellicoe – Part 1. Admiral Lord Jellicoe – Part 2. Admiral Lord Jellicoe – Part 3. John Boynton Priestley – Part 1. John Boynton Priestley – Part 2. Albert William Ketelbey – Part 1. Albert William Ketelbey – Part 2. Lewis Carroll – Part 1. Lewis Carroll – Part 2. Part 1 of an appraisal of the Island-born reforming headmaster of Rugby School. Part 2 of an appraisal of the Island-born reforming headmaster of Rugby School. Part 3 of an appraisal of the Island-born reforming headmaster of Rugby School. Part 4 of an appraisal of the Island-born reforming headmaster of Rugby School. Part 5 of an appraisal of the Island-born reforming headmaster of Rugby School. Part 6 of an appraisal of the Island-born reforming headmaster of Rugby School. Part 7 of an appraisal of the Island-born reforming headmaster of Rugby School. Part 8 of an appraisal of the Island-born reforming headmaster of Rugby School. Part 9 of an appraisal of the Island-born reforming headmaster of Rugby School. An appraisal of the Big Yachts of yesteryear. How the Cowes to East Cowes Floating Bridge came about. Spooks in Chale and Ryde. An appraisal of two-wheeled transport. Reflections on aspects of the Cowes Volunteer Training Corps. Reflections on an occasionally sea-going member of the author’s family. From schooners, topsail-schooners, brigs, brigantines, barques and barquentines to ships. A look at a pictorial magazine of 1901. An appreciation of Reverend Constantine Sinclair, former Rector of St Andrew’s, Chale. The Alexandra Hall in Cowes. When Cowes had three cinemas. Dr Arthur Thomas Shearman – poet, philosopher and logician. An account of some of the ships built by J. S. White & Co. of Cowes. An account of J. S. White & Co.’s Somerton Works. 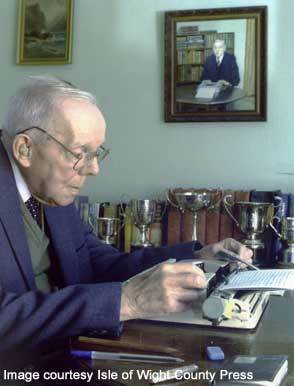 An account of the life and career of Lionel James, author and war correspondent. Adrian’s Ghost – a book by Mr T. C. Hudson. Born in Cowes 25th August 1910. Died in Northwood 13th July 2007. Island place names and their counterparts in Oz. A chance encounter with a Chelsea Pensioner. The calendar arrived by post. Reclusive, old, he sits alone. She lured him from a line of kings.